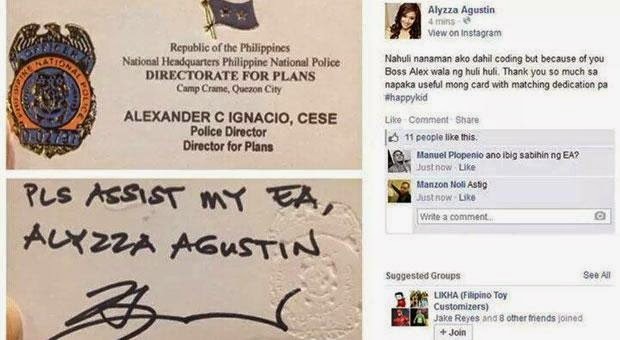 On the said post of the FHM model, she showed the business card of PNP Directorate for Plans Police Dir. Alexander Ignacio. At the back of the card, there is a short note asking anyone to assist his ‘EA’, accompanied by his signature. She then put a caption saying that she was once again caught wit a traffic violation and because of the said card, she was able to sway away from any reprimands and then ended it with a hashtag, #happy kid. She did not, however, discuss the meaning of EA so people had speculated as to what it stands for. Some people even voiced out that it might have meant ‘Extrang Asawa’ and Agustin is the officer’s mistress. The post had been deleted and the model’s account had been deactivated as it had been topics of different views on social networking sites. Dir. Ignacio is yet to release a statement as he is currently out of the country according to PNP spokesperson Wilben Mayor.